After buying a beautiful Dutch bakfiets (box bike) one wonders, When not cycling my kids about town, how can I monetize this bit of rolling stock? Answer: dream up a bakfiets winkelconcept (box bike shop idea). Wandering the streets of Seattle this summer, I’d fantasized about food trucks: mobile cafes (or “roach coaches”) that sell delicious snacks and seem to appear wherever one might want a little something. At one moment in Ballard, after drinking several margaritas, I thought, Why not import that disused, weed-spouting former food truck to Utrecht? I can make tacos at the back and the kids can do homework and play Minecraft at the front. Question now: Can I make tacos from a box bike? Some Californian living in Antwerp who calls himself The Taco Guy is already doing it, so it must be possible. Step One: Go to Antwerp. Lurk behind market herring stall and observe The Taco Guy’s method for slotting taco making supplies plus a cooler full of Jarritos and Coronas into a box bike. Note that he has an unwieldy trike-style bike and think about acquiring a separate trailer for the drinks cooler. 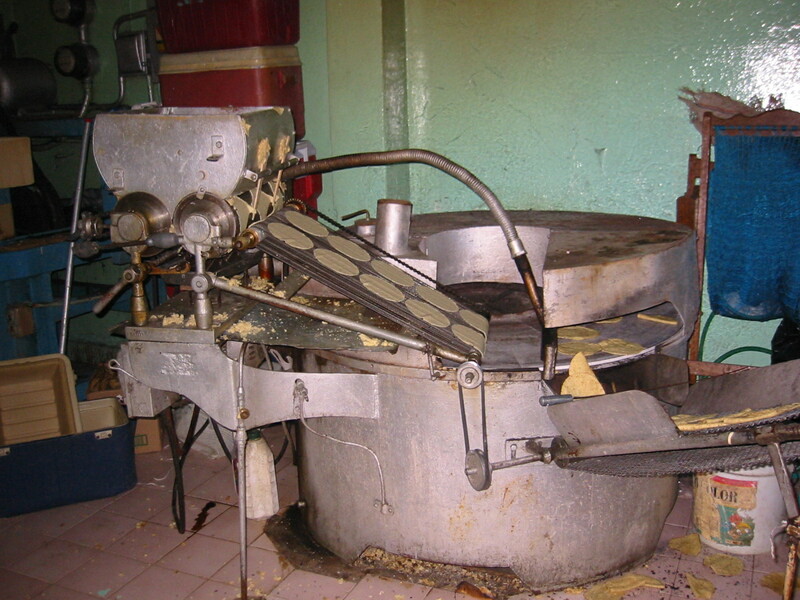 Step Two: Import tortilla making machine from Mexico and install it in corner of youngest child’s bedroom. Step Three: Determine taco-selling schedule by following the ijsfiets (ice cream bike) around town. Study university time table/bar closing times. Step Four: Remember that I worked in a family style, volume-sales, Italian eatery in Salt Lake City from 1994 to 1997 and never want to work in food service ever again. Step Five: Consider taco bike concept as performance art piece. 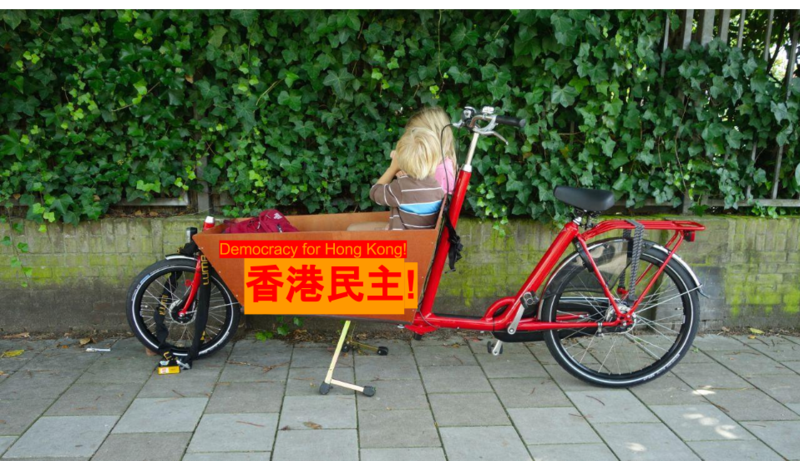 Step Six: Lease bakfiets on part-time basis to Red Banner Sister for use as propaganda bike. A taste of Hong Kong politics right now? Read this Evan Osnos’ New Yorker comment China’s Hong Kong Mistake. ← Feeling better about Dutch prospects? Or worse about Chinese efforts? Ah now, I was starting to get excited there…! That taco machine would have made a nice addition to the kid’s bedroom… so many moving parts… just imagine the possibilities! The mechanical background noise would have lulled them both to sleep. Just have to watch the moving parts! I’m sure Phuket would benefit from a taco bike! This idea is perfect! And the food would be so much better for you than those little paper cones full of pomme frites. Perhaps this post will encourage someone in both of our towns to realize the taco bike concept! Or maybe The Taco Guy of Antwerp will franchise? I love Red Banner Sister but let’s just back up here and go for performance art, because that was clearly the winner. Other taco bikes just sell food. You are going to invite people to question the meaning of hunger. As revealed on Twitter, I am fully on-board with this concept. Idea one: cycle around Utrecht at bar closing time wafting the smell of delicious tacos into the air, but without actually selling anything. You could ask patrons, instead of buying a taco and taking it away, to prepare their own tacos from imaginary ingredients located in their immediate vicinity. Doing so would reveal the true food within the bike. And of life. Or something. I see you’ve been mulling the idea over these last 24 hours. Utrecht is very artsy, and I expect this concept to be well received. I just remembered it this evening when Æ started talking about conceptual art, for reasons I can’t quite remember. 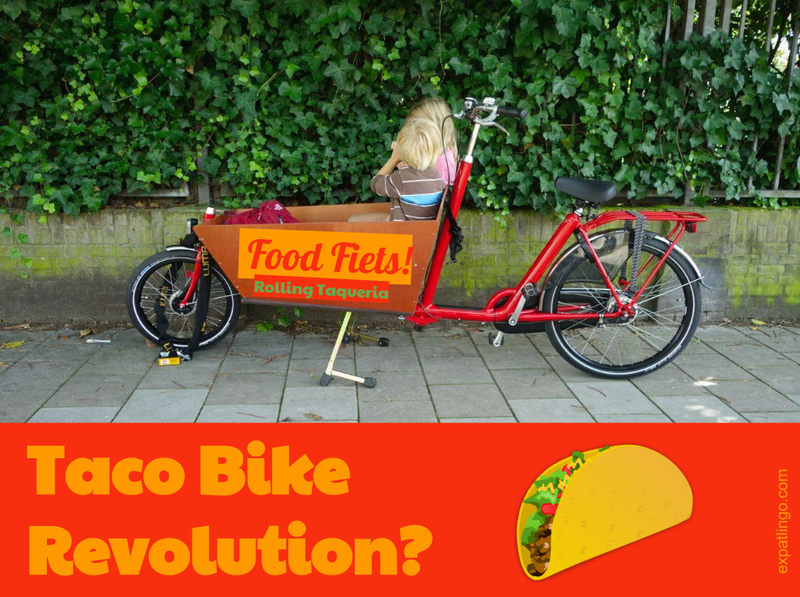 Maybe you could offer the bike to riders with the instruction to go around Utrecht on a taco-selling mission to feed their hunger. Only you don’t give them tacos to sell. The rest is up to them. In this way they discover either that life presents many ways to “sell tacos” or that you can get really hungry riding an empty bike around town. Where do I apply to work a shift? I will ask patrons: what would be in your taco, if we actually had tacos? While small incandescent packets of salsa verde pulse to the rhythm of the crowd’s hunger pains. I’ll have two with extra guac please! Sounds delicious, right? What I need is for someone else to realize this idea, so I can eat tacos whenever I want. Tacos don’t hold a candle to BBQ’d squid or potstickers. Instead of taking taco guy head on, I’d suggest doing something more Chinese. “Buy a Red Banner Sister mooncake and she’ll moon for you.” I think the good people of Utrecht would be good for this. Just make sure there are no preservatives in the mooncakes. Happy Midautumn Festival in the Netherlands! I like this Chinese-food angle. I’ll be ready to sell my own-brand moon cakes for Mid-Autumn Festival 2015. In the meantime, maybe roasted duck heads displayed in a glass case under a light with a red shade (just like the guy around the corner from my house in Zhuhai)? Yes, cupcakes and coffee would be very cozy!